A total of 1052 EOIs were issued under the SkillSelect system in the invitation round held on the 4th October 2017. The following graph shows the points for clients who were invited during the 4th October 2017 application round. 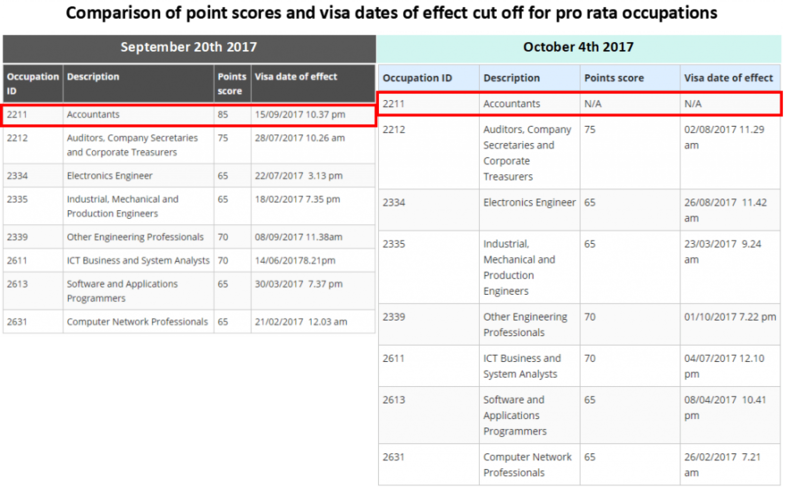 Below is the point scores and the visa dates of effect cut off for the pro rata occupations in the 4th October 2017 invitation round. 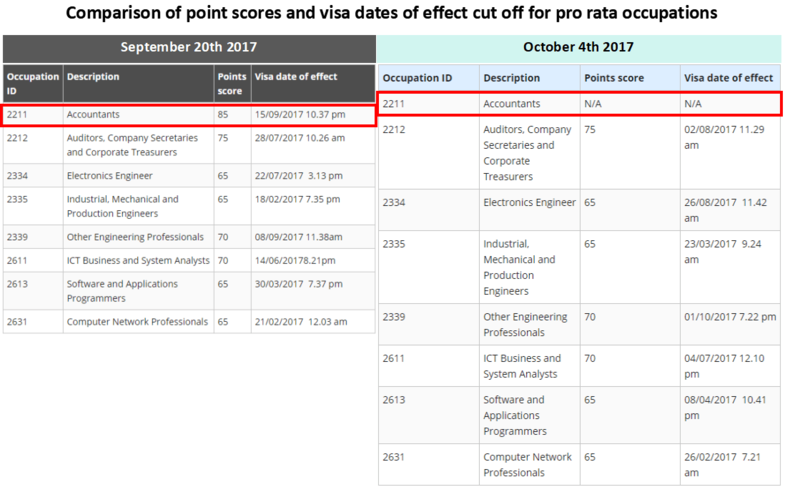 When we compare the point scores required for invitation across different professions for the previous round (20th September 2017) and the latest round (4th October 2017), it is important to note that for the Accountant occupation, the point score was at a high 85 in the 20th September round and now N/A in the 4th October round. Three possible explanations could be with regards to this data. Firstly, this could be due to no many accountant applicants reaching the set point score in the September round, which caused the office to decide not to invite accountants in the October round. Secondly, this could happen for other occupations as well if applicants do not meet the set point score. This shows that it is absolutely necessary to get point score which is as high as possible to get invitations and ensure future invitations for any pro rata occupation! Thirdly, this could have been a case of misreported data due to system errors. These are reasonable guesses, however the immigration office has not addressed these concerns nor provided explanation for their data. Nonetheless, the fact remains that to increase chances of being invited, you must have a high points score which are given according to your age, skills, occupation, Australian work experience, Australian qualifications and English language ability. Of all the requirements, the English language ability is the easiest to adjust to raise the point score. For testing English language proficiency, taking the PTE Academic Test is currently a much more viable option than taking IELTS. Firstly, not only are the results for the PTE Academic Test available within one day (up to five working days) but taking the test is also cheaper than taking IELTS. 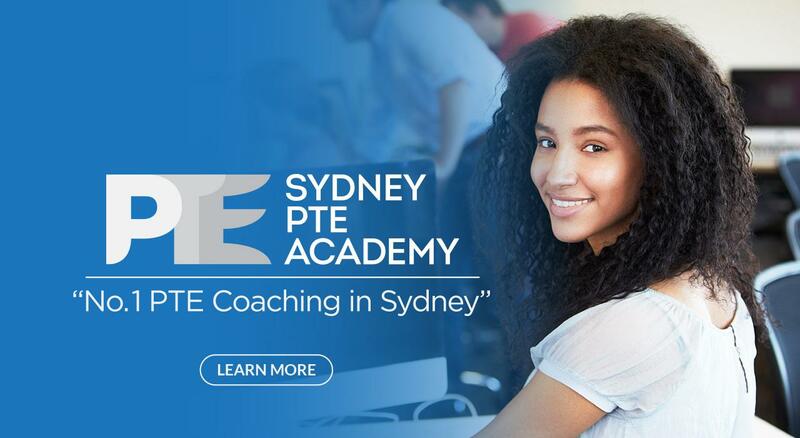 Secondly, PTE is also generally considered an easier alternative to IELTS as it is a computer based literacy test, meaning that there is no bias from human examiners. The next selection round will take place on the 18th of October 2017 . A maximum of 1250 EOIs will be issued invitations for Skilled Independent visa. 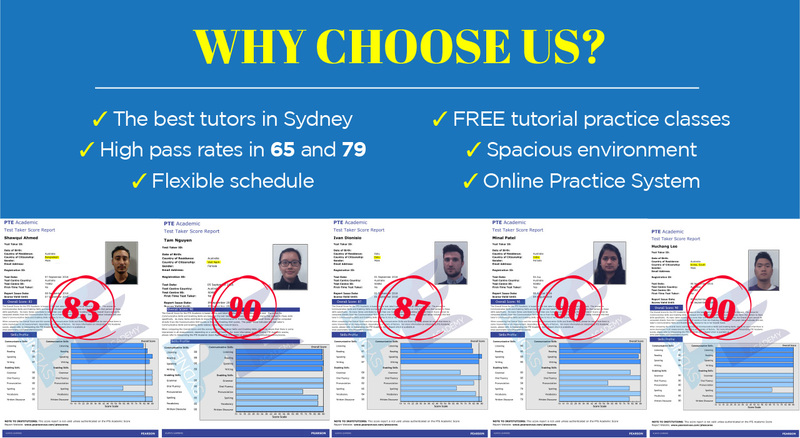 To ensure that you accumulate the highest points score possible in time for the next SkillSelect selection round, enrol with us at Sydney PTE Academy where our highly qualified teachers can guide you and help you to reach your desired score.